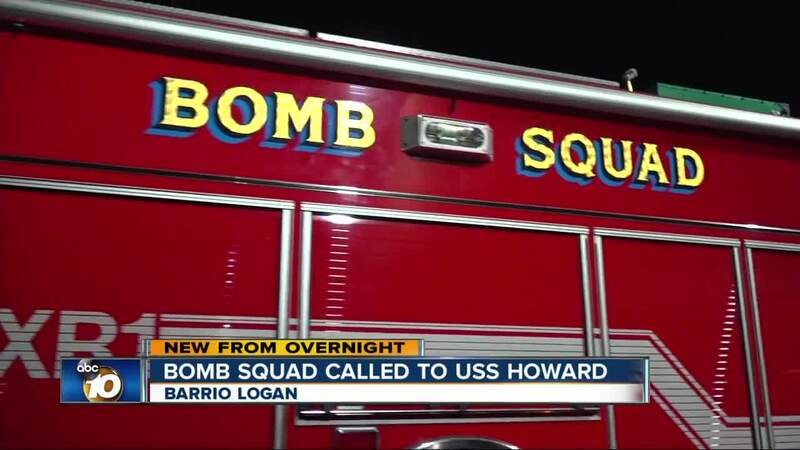 SAN DIEGO (KGTV) - A suspicious item discovered on a Navy ship Tuesday night prompted a major response from first responders, including a bomb squad, but the object turned out to be harmless. A worker told 10News the suspicious item was found at a dry dock area at the BAE Systems complex in the 2200 block of Belt Street. The object was apparently inside of the USS Howard, which was at the facility for repair. Authorities did not immediately disclose what the object was, but the discovery led to a massive response from the San Diego Fire-Rescue Department’s bomb squad, Harbor Police, Homeland Security officials and a hazardous materials team. After a thorough inspection, the item was determined to be harmless and an all-clear was given for the ship and surrounding area. Authorities told 10News there have been some reported non-credible bomb scares at the same location in the last several weeks, but details on the previous threats were not provided.